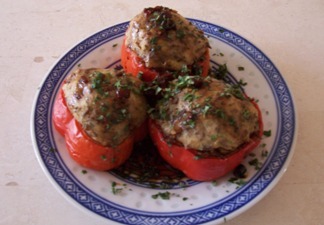 Stuffed peppers, an excellent combination of peppers and ground beef recipe. You can use this recipe in combination with white rice or grilled potatoes, it's just delightful. Beside that the look so lovely is, the taste is also very yummy and very suitable for birthday or party as a decoration for some rice dishes. You can also use peppers instead red chilies. They aren't so hot and spicy, so you can make it for the whole family, including for your children. Make a smooth paste of candlenuts, coriander, shallots, garlic, pepper and salt. Set aside. Heat 2 tablespoon vegetable oil and fry the paste until fragrant, add the ground beef in de frying pan until water has evaporated and the beef has changed color. Beat 1 egg and add to the mixture. Blend it until smooth. Beat the other eggs and paint the inside of the chilies with the egg wash. Stuff the peppers with the meat mixture. Paint the outside of the meat stuffing in the chili peppers with the beaten egg to prevent the stuffing from disintegrating during the final cooking. Bake in the oven, or fry in the hot oil until the meat mixture is a golden brown. To make this dish more tasteful, pour some oriental spicy sweet soya sauce (sambal kecap) over the dish. Mix all the ingredients together, and ready to serve.